[caption id="attachment_5129" align="alignnone" width="540" caption="100 Days of Active Resistance"] [/caption] 100 Days of Active Resistance is a beautiful compilation of images that "go deep in order to understand who we are, what the world is and how things could be better." On Day 87 you'll find the MAKE [THIS] BETTER poster. Buy the book. 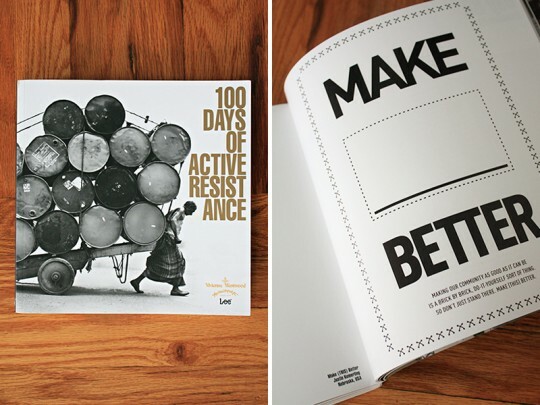 In 2010 Vivienne Westwood and Lee Jeans launched an online manifesto-installation titled 100 Days of Active Resistance. The website invited people to submit an artwork, slogan or photograph responding to Westwood's conception of Active Resistance to Propaganda, in which she argues for culture's capacity to elevate humanity above self-destruction. It is not enough to follow world politics, see films and read the prizewinning bestsellers, she insists; this is superficial, you need to go deep in order to understand who you are, what the world is and how things could be better. This involves culture which can only be acquired by self-education: human beings should mirror the world. Starting on September 8, 2010, for100 days, one artwork was showcased online daily, ending with an exhibition displaying a selection ofthe best contributions. This volume gathers these works and commemorates the project. This entry was posted on Sunday, December 18th, 2011 at 8:40 am by Justin Kemerling	and is filed under Art, Design, Politics, Work. You can follow any responses to this entry through the RSS 2.0 feed. You can leave a response, or trackback from your own site.